If positioning be marketing’s equivalent of location, then Pawel Huelle is right in front of Harrod’s: a Polish writer from Gdansk, with a German-sounding last name, and writing about his city’s prewar past, he is Paul to Günter Grass’s Peter, his left-hand path, his mirror image, his Other without which the German Nobelist is nothing but the one-sided voice of the displaced, irrelevant, powerless ethnic German Danzingers. It is perhaps in recognition of this – and not merely Huelle’s superb writing (what am I saying?! Merely superb-writing?!) – that Günter Grass has been promoting him. Thankfully, the man’s ambition knows no bounds: having so easily done Grass, Huelle nonchallantly reached for the utlimate prize and – did Mann: his Castorp is a prequel to Magic Mountain. It is a short, clever, delightful novel about Mann’s unlikely hero’s halcyon days in Gdansk. (“[Castorp] had spent four semesters at the Danzig Polytechnic” Mann tells us in a small detail which you have probably missed). 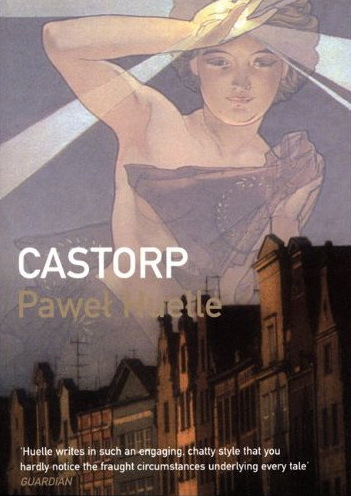 Indeed, much of the pleasure of reading Castrop is Mannisch: the description of the hero’s sailing from Hamburg to Gdansk is reminiscent of Castorp’s train trip in the Magic Mountain, the meals on board of the meals at the Berghof, and the scene in which the first mate shows the young hero the engine room of the steamship, of the x-ray scene in Mann. Huelle does this well: he maintains the same tempo, the same delectation of facts, the same economy of words mastering the same power of symbolism. Un-Mann-like, the story is wonderfully whimsical – Inspector Cluzoe-like, Castrop rubs shoulders against crime and political intrigue without noticing. Also un-Mann-like, it is peppered with small, carefully disguised details which will escape you, Castorp-like, unless you pay attention: the psycho-analyst (1905!) is a student of Doctor Charcot, not Freud; the hero travels to Zoppot in search of Maria Mancinis; the ship Castorp passes at sea, the ABPOPA, is in fact AVRORA (its guns will start the October revolution – and thus announce the beginning of the end of Castorp’s world). Etc. As he focused on descriptive geometry, the basics of machine building, applied mathematics or technical drawing exercises, Castorp sometimes liked to free his attention from the lesson, prop his chin on his fist, and stare out of a large window, as outside, against the pure blue sky, dazzling white cumulus clouds, slowly and majestically went sailing by. Only once he was in the tram did Castorp free himself from these memories. Their place was taken by pure music. He had never had such a strange experience before: the tune his father had played on the piano and the fisher-girl’s song were both ringing inside him simultaneously, purely and faultlessly, without causing any confusion, just as if Schubert, who wrote the first, also had the perfect knowledge of the second, or maybe even – what an absurd idea – composed his song about three phantom suns not so much under the influence of his local folk song, but as its reflection – not a symmetrical mirror image, not something immobile, but captured in a mirror of water, and thus a live and vibrant reflection. Castorp’s thoroughly analytical turn of mind allowed him to internalize both tunes like mathematical functions, which, while running in total void, as if in a sphere of complete silence, diverged abruptly, then, after a set period of time crossed paths at a predetermined point, only for each of them to seek its way again. And as the window he was sitting at quickly steamed up, Castorp drew these two lines on the whitish surface and inspected them with an emotion similar to the one he had felt not long ago while watching the depths of the sea churned up by the ship’s propeller. The novel is a marvel, the translation is excellent, and the book itself is well made: it is small, light, beautifully bound, with nice typeface on delicate paper. Five stars.